Get ready, ladies and gentlemen! Two of the nation’s best-loved bands are on tour together in 2019!! 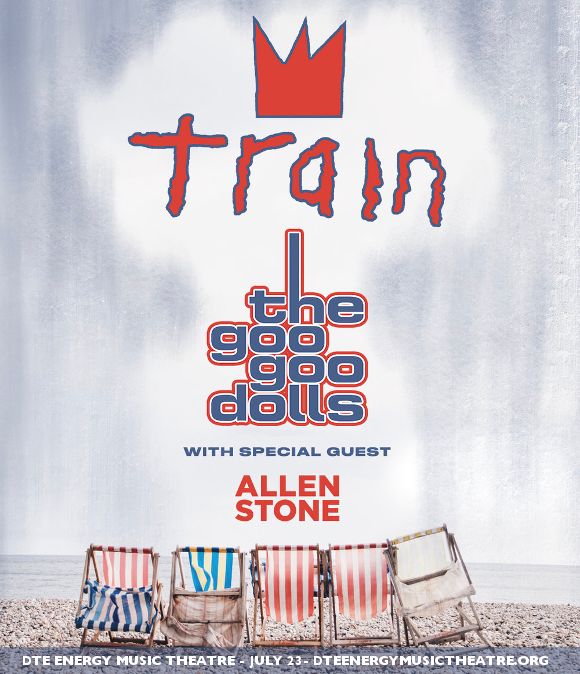 That’s right, its Train and the Goo Goo Dolls, on a massive North American tour with special guest Allen Stone!! These three incredible acts are headed to the DTE Energy Music Theatre on Tuesday 23rd July 2019 – be there!! Tickets are now on sale – book your space at the Train, Goo Goo Dolls and Allen Stone concert today!! Coming together in 1993, Train were met with instant mainstream success with their debut album “Train,” which has since gained Platinum certification. Their sophomore in 2001, “Drops Of Jupiter,” contained the single "Drops of Jupiter (Tell Me)” described in a glowing review by Rolling Stone as; “ the centerpiece here, showcasing the singer's yearning voice and band's swooping, string-laden melodies”. The song won the band two Grammy Awards, for Best Rock Song and Best Instrumental Arrangement Accompanying Vocalist out of the five total awards for which it was nominated, and helped make “Drops Of Jupiter” their best-selling album ever. As for the Goo Goo Dolls, even those who don’t know the name are able to place their record-breakingly successful single “Iris”. Originally featured in the film “City Of Angels,” and later on the band’s sixth album “Dizzy Up The Girl,” the single has become one of the biggest in popular music history, spending nearly 12 months in the charts and hitting the No. 1 spot in Australia, Canada, and Italy, and charting in the top ten of countless regions. Are you ready to see these two incredible bands live?? Hurry and get your hands on those tickets!